In his latest book, the world’s most eminent physicist Stephen Hawking argues that the laws of physics, not the will of God, provide the real explanation as to how life on earth came into being. Yet physical laws on their own cannot create anything; they are merely a description of what normally happens under certain given conditions. Although Hawking's argument is being hailed as controversial and ground-breaking, it is hardly new. This article is based on one that appeared in the Daily Mail, September 3, 2010. It is an initial response to Stephen Hawking and Leonard Mlodinow’s book The Grand Design. This article may not be placed on the Internet or reproduced without permission. © John Lennox, September 2010. Although Hawking's argument is being hailed as controversial and ground-breaking, it is hardly new. For years, other scientists have made similar claims, maintaining that the awesome, sophisticated complexity of the world around us can be interpreted solely by reference to the basic stuff of the universe (mass/energy) or to its physical laws such as gravity. In the excerpts I have seen from the book (at this writing it is not yet in the shops) there are what appear to be a number of misunderstandings and logical errors. Firstly, Hawking’s view of God is inadequate. From what I cited above, it would seem that he thinks of God as a “God of the Gaps” put forward as an explanation if we don’t yet have a scientific one—hence his conclusion that physics has no room for God as it has removed the last place where He might be found— for the moment of creation. But this is certainly not what any of the great monotheistic religions believe. For them, God is not only to be found at creation; He is the author of the whole show. God both created the universe and constantly sustains it in existence. Without Him, there would be nothing there for physicists to study. In particular, therefore, God is the creator both of the bits of the universe we don’t understand and the bits we do. And it is, of course, the bits we do understand that give the most evidence of God’s existence and activity. Indeed, just as I can admire the genius behind a work of engineering or art the more I understand it, so my worship of the Creator increases the more I understand what He has done. Hawking’s inadequate view of God could well be linked with his attitude to philosophy in general. He writes, “Philosophy is dead. It has not kept up with modern developments in science, particularly in physics. As a result scientists have become the bearers of the torch of discovery in our quest for knowledge.”(2) What an astonishing statement! Apart from the scientistic hubris of this statement, it constitutes wonderful evidence that at least one scientist, Hawking himself, has not only not kept up with philosophy, he does not appear to understand the first thing about it, nor its commitment to the elementary rules of logical analysis. For Hawking’s statement is itself a philosophical statement. It is manifestly not a statement of science; it is a philosophical statement about science. Therefore, because it says that philosophy is dead, it contradicts itself. It is a classic example of logical incoherence. Not only that, Hawking, insofar as he is interpreting and applying science to ultimate questions like the existence of God, is doing metaphysics. Saying philosophy is dead is very dangerous especially when you yourself engage in it. Take, for instance, Hawking’s statement quoted above: “Because there is a law of gravity the universe can and will create itself from nothing.” Clearly, he assumes that gravity (or perhaps only the law of gravity?) exists. That is not nothing. So the universe is not created from nothing. Atkins dubs this the “Cosmic bootstrap” principle, referring to the self contradictory idea of a person lifting himself by pulling on his own bootlace. His Oxford colleague, philosopher of religion Keith Ward, is surely right to say that Atkins’s view of the universe is as blatantly self-contradictory as the name he gives to it, pointing out that it is “logically impossible for a cause to bring about some effect without already being in existence.” Ward concludes: “Between the hypothesis of God and the hypothesis of a cosmic bootstrap, there is no competition. We were always right to think that persons, or universes, who seek to pull themselves up by their own bootstraps are forever doomed to failure.”(4) What this shows is that nonsense remains nonsense even when talked by world-famous scientists. Because Hawking has both an inadequate concept of God and of philosophy, he blunders into a further series of errors by asking us to choose between God and the laws of physics. Here he confuses two very different things: physical law and personal agency. The choice he asks us to make is between false alternatives. This is a classic category error. His call for us to choose between physics and God is as manifestly absurd as demanding that we choose either the laws of physics or aeronautical engineer Sir Frank Whittle in order to explain the jet engine. Both explanations are necessary: they do not conflict, but complement one another. That category mistake was not made by a previous holder of Hawking’s chair at Cambridge, Sir Isaac Newton. When Newton discovered his law of gravitation he did not say, “Now I have gravity, I don’t need God.” What he did was to write Principia Mathematica, the most famous book in the history of science, expressing the hope that it would “persuade the thinking man” to believe in God. The laws of physics can explain how the jet engine works but not how it came to exist in the first place. It is self-evident that a jet engine could have not have been created by the laws of physics on their own—that task needed the intelligence and creative engineering work of Whittle. Indeed, come to think of it, the laws of physics plus Frank Whittle could not on their own produce a jet engine. There needs additionally to be some material around the place that is subject to those laws and that can be worked on by Whittle. For, not only did scientists not put the universe there, neither did science or the laws of mathematical physics. Yet Hawking seems to think they did. In A Brief History of Time he hinted at this kind of explanation in suggesting that a theory might bring the universe into existence: The usual approach of science of constructing a mathematical model cannot answer the questions of why there should be a universe for the model to describe. Why does the universe go to all the bother of existing? Is the unified theory so compelling that it brings about its own existence? Or does it need a creator, and, if so, does he have any other effect on the universe? (5) The idea of a theory or physical laws bringing the universe into existence strikes me as a serious misunderstanding of the nature of such laws—or am I missing something? Scientists expect to develop theories involving mathematical laws that describe natural phenomena, and have done so with spectacular success. However, the laws that we find cannot themselves even cause anything, let alone create it. It seems to me delightfully ironic that, if I dare mention it, no other than William Paley said as much long ago. Speaking of the person who had just stumbled on a watch on the heath and picked it up, he says that such a person would not be less surprised to be informed, that the watch in his hand was nothing more than the result of the laws of metallic nature. It is a perversion of language to assign any law, as the efficient, operative cause of any thing. A law presupposes an agent; for it is only the mode, according to which an agent proceeds: it implies a power; for it is the order, according to which that power acts. Without this agent, without this power, which are both distinct from itself, the law does nothing; is nothing. (6) Physical laws on their own cannot create anything; they are merely a (mathematical) description of what normally happens under certain given conditions. Newton’s Law of Gravitation does not create gravity. It does not even explain gravity, as Newton himself realized. In fact, the laws of physics are not only incapable of creating anything, they cannot even cause anything to happen. For instance, Newton’s celebrated laws of motion never caused a snooker ball to race across the green baize table: that can only be done by people using a snooker cue and the actions of their own muscles. The laws enable us to analyze the motion and enable us to map the trajectory of the ball’s movement in the future (provided nothing external interferes), (7) but they are powerless to move the ball, let alone bring it into existence. Yet well-known physicist Paul Davies appears to agree with Hawking: There’s no need to invoke anything supernatural in the origins of the universe or of life. I have never liked the idea of divine tinkering: for me it is much more inspiring to believe that a set of mathematical laws can be so clever as to bring all these things into being. (8) However, in the world in which most of us live, the simple law of arithmetic, 1+1 = 2, never brought anything into being by itself. It certainly has never put any money into my bank account. If I first put £1,000 into the bank and then later another £1,000, the laws of arithmetic will rationally explain how it is that I now have £2,000 in the bank. But if I never put any money into the bank myself and simply leave it to the laws of arithmetic to bring money into being in my bank account, I shall remain permanently bankrupt. C. S. Lewis saw this long ago. Of the laws of nature he says: They produce no events: they state the pattern to which every event—it only it can be induced to happen—must conform, just as the rules of arithmetic state the pattern to which all transactions with money must conform—if only you can get hold of any money. Thus in one sense the laws of Nature cover the whole field of space and time; in another, what they leave out is precisely the whole real universe—the incessant torrent of actual events which makes up true history. That must come from somewhere else. If Hawking were not so dismissive of philosophy he might have come across Wittgenstein statement that the “deception of modernism” is the idea that the laws of nature explain the world to us when all they do is to describe structural regularities. Richard Feynman, a Nobel Laureate in physics, takes the matter further: …the fact that there are rules at all to be checked is a kind of miracle; that it is possible to find a rule, like the inverse square law of gravitation, is some sort of miracle. It is not understood at all, but it leads to the possibility of prediction—that means it tells you what you would expect to happen in an experiment you have not yet done. (10) The very fact that those laws can be mathematically formulated was for Einstein a constant source of amazement that pointed beyond the physical universe to that “spirit vastly superior to that of man.” Hawking has signally failed to answer the central question: Why is there something rather than nothing? He says that the existence of gravity means the creation of the universe was inevitable. But how did gravity come to exist in the first place? What was the creative force behind its birth? Who put it there with all its properties and potential for mathematical description? Similarly, when Hawking argues, in support of his theory of spontaneous creation, that it was only necessary for “the blue touch paper” to be lit to “set the universe going,” I am tempted to ask: where did this blue touch paper come from? It is clearly not part of the universe if it set the universe going. So who lit it, if not God? Allan Sandage, widely regarded as the father of modern astronomy, discoverer of quasars and winner of the Crafoord Prize, astronomy’s equivalent of the Nobel Prize, is in no doubt about his answer: I find it quite improbable that such order came out of chaos. There has to be some organizing principle. God to me is a mystery but is the explanation for the miracle of existence—why there is something rather than nothing. (11) Trying to avoid the clear evidence for the existence of a divine intelligence behind nature, atheist scientists are forced to ascribe creative powers to less and less credible candidates like mass/ energy and the laws of nature. In fact, Hawking not only has not got rid of God, he has not even got rid of the God of the Gaps in which no sensible person believes. Thus we arrive at the multiverse. The idea here, roughly speaking as there are several theories, is that there are so many universes (some suggest infinitely many, whatever that means) that anything that can happen will happen in some universe. It is then not surprising, so the argument goes, that there is at least one universe like ours. (13) We note in passing that Hawking has once again fallen into the trap of offering false alternatives: God or the multiverse. From a theoretical point of view, as philosophers(that despised race) have pointed out, God could create as many universes as he pleases. The multiverse concept of itself does not rule God out. In addition to that, forgetting other universes, the physical constants in this universe are fine-tuned. They could have been otherwise, so that the theory of the multiverse does not, in any case, annul that evidence of God’s “Grand Design” that is to be perceived in the universe. But back to Hawking’s multiverse. Here, once more, he moves out beyond science into the very realm of philosophy whose death he announces in the very same book. Furthermore, Hawking claims to be the voice of modern science. This gives a false impression where the multiverse is concerned, since there are weighty voices within science that do not support Hawking’s view. For instance, John Polkinghorne, himself an eminent theoretical physicist, rejects the multiverse concept: Let us recognize these speculations for what they are. They are not physics, but in the strictest sense, metaphysics. There is no purely scientific reason to believe in an ensemble of universes. By construction these other worlds are unknowable by us. A possible explanation of equal intellectual respectability—and to my mind greater economy and elegance—would be that this one world is the way it is, because it is the creation of the will of a Creator who purposes that it should be so. (14) I am tempted to add that belief in God seems an infinitely more rational option if the alternative is to believe that every other universe that can possibly exist does exist, including one in which Richard Dawkins is the Archbishop of Canterbury, Christopher Hitchens the Pope, and Billy Graham has just been voted atheist of the year! To be serious once more (but perhaps I was serious), Hawking’s ultimate theory to explain why the laws of physics are as they are is called M-theory, a theory of supersymmetric gravity that involves very sophisticated concepts such as vibrating strings in eleven dimensions. Hawking confidently calls it the “unified theory that Einstein was expecting to find.” If it is, it will be a triumph of mathematical physics. But, for the reasons given above, far from administering the deathblow to God, it will give us more even more insight into his creatorial wisdom. Don Page, a theoretical physicist from the University of Alberta who is a former student of Hawking and has co-authored eight papers with him says, “I certainly would agree that even if M-theory were a fully formulated theory (which it isn’t yet) and were correct (which of course we don’t know), that would not imply that God did not create the universe. (15) Although it does not, therefore, affect my argument at all, it is worth recording that not all physicists are as convinced as Hawking about the validity of his theory and have been quick off the mark to say so. For instance, theoretical physicist Jim Al-Khalili says, The connection between this multiverse idea and M-theory is, however, tentative. Paul Davies, whom we cited above, says of M-theory, “It is not testable, not even in any foreseeable future.”(17) Oxford physicist Frank Close goes further: “M-theory is not even defined… we are even told ‘No one seems to know what the M stands for.’ Perhaps it is ‘myth.’” Close concludes, “I don’t see that M-theory adds one iota to the God debate, either pro or con.” (18) Jon Butterworth, who works at the Large Hadron Collider in Switzerland, states that “M-theory is highly speculative and certainly not in the zone of science that we have got any evidence for.” (19) A move to advance the cause of atheism by means of a highly speculative, untestable scientific theory which, even if it were true, could not dislodge God in any case, is not likely to be very effective. Much of the rationale behind Hawking’s argument lies in the idea that there is a deep-seated conflict between science and religion. But this is not a discord that I recognize. For me, as a Christian believer, the beauty of the scientific laws reinforces my faith in an intelligent, divine Creator. The more I understand science, the more I believe in God because of my wonder at the breadth, sophistication, and integrity of his creation. Indeed, the very reason that science flourished so vigorously in the sixteenth and seventeenth centuries under men like Galileo, Kepler, and Newton was precisely because of their conviction that the laws of nature that were then being discovered and defined reflected the influence of a divine law-giver. One of the fundamental themes of Christianity is that the universe was built according to a rational, intelligent design. Far from belief in God hindering science, it was the motor that drove it. The fact that science is (mainly) a rational activity leads us to another flaw in Hawking’s thinking. He, like so many atheists, wants us to believe that we human beings are nothing but “mere collections of fundamental particles of nature.” He does not seem to realize that, if this were true, it would not only undermine belief in God, it would undermine the very rationality we need to study science. Indeed, if it were true, how could we even know it? After all, if the brain is thus merely the end product of a mindless unguided process then there is no reason to believe in its capacity to tell us the truth. Hawking’s view makes no sense— in every sense of that word. The existence of the capacity for rational thought is surely a pointer, not downwards to chance and necessity, but upwards to an intelligent source of that capacity. We live in an information age and we are well aware that language type information is intimately connected with intelligence. For instance, we only have to see a few letters of the alphabet spelling our name in the sand to recognize at once the work of an intelligent agent. How much more likely, then, is the existence of an intelligent creator behind human DNA, the colossal biological database that contains no fewer than 3.5 billion “letters”—the longest “word” yet discovered? It is fascinating that Hawking, in attacking religion, feels compelled to put so much emphasis on the Big Bang theory. Because, even if the non-believers don’t like it, the Big Bang resonates powerfully with the Christian narrative of creation. That is why, before the Big Bang gained currency, so many scientists were keen to dismiss it, since it seemed to support the Bible story. Some clung to Aristotle’s view of the “eternal universe” without beginning or end; but this theory, and later variants of it, are now discredited. The Bible, which has been quietly asser ting for millennia that there was a beginning, has proved to be correct. It is important finally to say that rational support for the existence of God is not only to be found in the realm of science, for science is not (as some think) co-extensive with rationality. History supplies us with powerful evidence that God revealed himself to mankind through Jesus Christ two millennia ago. This is well-documented not just in the biblical record; there are important extra-biblical sources and a wealth of archaeological findings that confirm the reliability of the biblical narrative. My faith in God rests not only on the testimony of science but also on the testimony of history, particularly to the fact that Jesus Christ rose from the dead. Moreover, the religious experience of millions of believers cannot lightly be dismissed. I myself and my own family can testify to the uplifting influence that faith in Christ as Lord has had on our lives, something which defies the idea that we are nothing more than a random collection of molecules. Just as strong is the obvious reality that we are moral beings, capable of understanding the difference between right and wrong. There is no scientific route to such ethics. Physics cannot inspire our concern for others, or the spirit of altruism that has existed in human societies since the dawn of time. The existence of a common pool of moral values points to the existence of a transcendent being beyond mere scientific laws. Indeed, the message of atheism has always been a curiously depressing one, portraying us as selfish creatures bent on nothing more than survival and self-gratification. Atheism is a hope-less faith. By contrast, the Christian message, based solidly on the resurrection of Jesus Christ from the dead, gives real hope. Hawking also thinks that the potential existence of other life forms in the universe undermines the traditional religious conviction that we are living on a unique, God-created planet. But there is no proof that other life forms are out there, and Hawking certainly does not present any. It always amuses me that atheists often argue for the existence of extraterrestrial intelligence beyond earth. Yet they are only too eager to denounce the possibility that there exists a vast, intelligent being “out there”—God. Hawking’s fusillade will not shake the foundations of an intelligent faith that is based on the cumulative evidence of science, history, the biblical narrative, and personal experience. 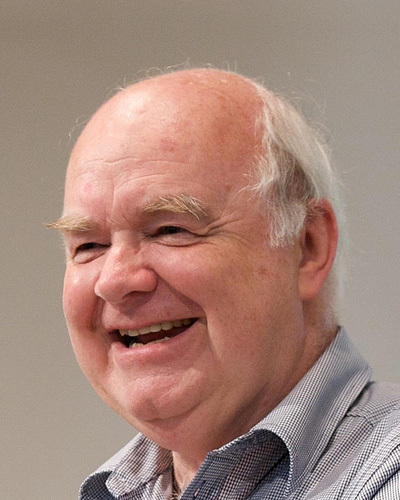 John Lennox is Professor of Mathematics at the University of Oxford, Fellow in Mathematics and the Philosophy of Science, and an adjunct lecturer with the RZIM team at the Oxford Centre for Christian Apologetics. 1 Excerpt from Stephen Hawking and Leonard Mlodinow’s The Grand Design in The Times Eureka, Issue12 (September 2010), 25. 3 Peter Atkins, Creation Revisited (Harmondsworth, UK: Penguin, 1994), 143. .5 Stephen Hawking, A Brief History of Time (London: Bantam Press, 1988), 174. 7 I am well aware that chaotic considerations (sensitivity to initial conditions) make this prediction practically impossible for all but the first few ricochets of the ball. 8 See Clive Cookson, “Scientists who glimpsed God,” Financial Times (April 29, 1995), 20. 9 C. S. Lewis, Miracles (London: Fontana, 1974), 63, 90-91. 10 Richard Feynman, The Meaning of It All (London: Penguin, 2007), 23. 11 Allan Sandage as quoted in J.N Willford, “Sizing up the Cosmos: An Astronomers Quest,” The New York Times (12 March 1991), B9. 12 Hawking in The Times Eureka, 24. 13 For more on this concept, see John Lennox’s God’s Undertaker: Has Science Buried God? (Oxford: Lion UK, 2009), 69-77. 14 John Polkinghorne, One World (London: SPCK, 1986), 80. 15 Private communication, reproduced with permission. 16 Hawking, 23.17 As quoted in Hannah Devlin,“Hawking: God did not create Universe,” The Times (4 September 2010). 19 As quoted in Devlin, The Times.